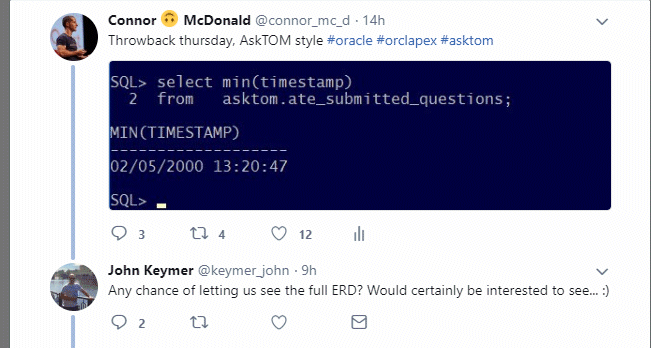 I popped out a tweet yesterday in Throwback Thursday style showing the date of the first question we took AskTOM – 18 years ago! Many entire computer systems don’t even last that long, and AskTOM hasn’t really needed to change that much in those 18 years. We’ve added a new skin, added the ability to have multiple AskTOM experts on the answer team, and of course, our new-for-2018 Office Hours program, which gives everyone free access to experts inside Oracle Corporation. John replied to my tweet asking if we could show the ERD. So here it is – I’ve taken out a few things here and there that don’t have any impact on the public facing part of AskTOM. And I’ve included some notes underneath about each table’s purpose in AskTOM. The administrators on AskTOM. There are various privilege levels such as being able to see the admin pages, view unanswered questions and actually answer them. Any messages that we want to appear on the Questions home screen, such as upcoming conferences etc. Files that support the answering of questions. 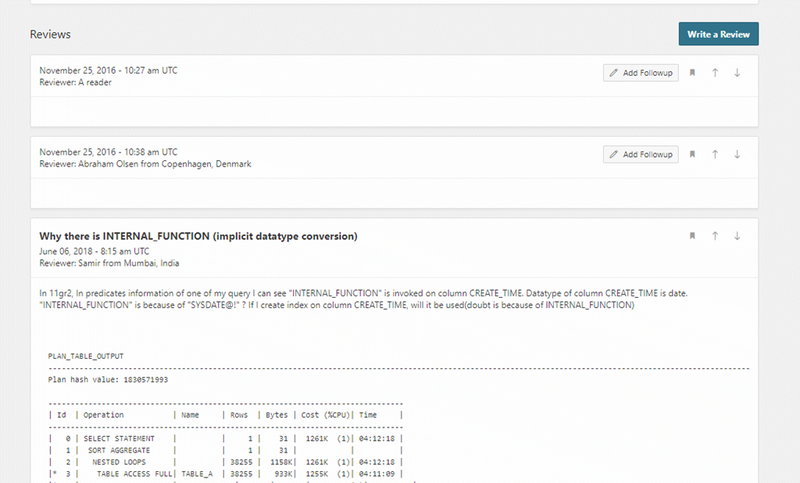 We’ll sometimes link in scripts, images etc to better answer a question. They are all stored in here, in the database of course. The presentations and other resources that you can download from the Resources page. Our recently added facility to allow people to give us feedback on the AskTOM application. The bread and butter of AskTOM. Your questions are stored here, along with our answer. When you submit a question, we record it as “New, Never Read”. Once we start working on it, we will then mark it as “Read, Not Answered” so that another AskTOM administrator does not work on it. 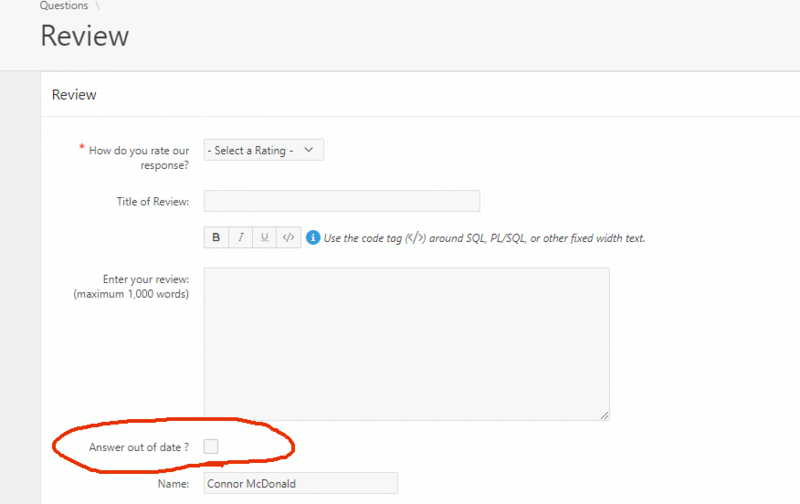 We might then have a little back-and-forth with our original submitter if we need more detail (which is a polite way of saying they didn’t read the Question Guidelines, and hence we didn’t get a test case or sample data or nicely formatted code etc etc) . So that is “Need More Info” and “More Info Supplied” statuses. Once we’ve answered the question, if we think the general community will benefit it will be “Answered Publish” which puts it up on the home page, otherwise its “Answered, Not Published”, which means the original submitter will see it, but no-one else. 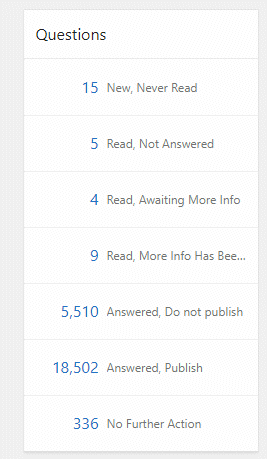 As you can see from the numbers in the picture (taken today), for the 18,500 questions you can see on AskTOM, there’s another 5,500 we’ve answered that don’t make the front page. The review comments from the community, and our follow-ups for each question that we answer. We read every single review that comes into AskTOM. They come in with a status of “New”, we’ll “Assign” them to an administrator, and once we’re done with it, we mark it “Complete”. 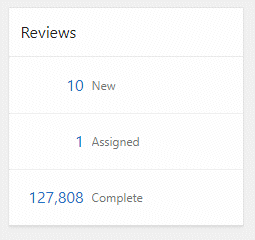 Yup, that’s over 125,000 reviews we’ve taken. We track our own performance on AskTOM so that we can better serve you all. So every time we change a question status, eg from “New” to “Need More Info” to “Answered” etc, we log the time at which the status change occurred so we can review it later to see how we’re tracking. 18 years of taking and answering questions means that some of the answers may no longer be correct or up to date. If a reviewer brings this to our attention, we’ll record it here as an action for an administrator to look at and rectify. If you’re wondering why it is not just a flag on the question, that’s because a single question may become obsolete more than once in as time marches on. Every time you click on a question in AskTOM, we record that fact. Why? Because that drives the metrics on knowing which questions are most sought after by the community. 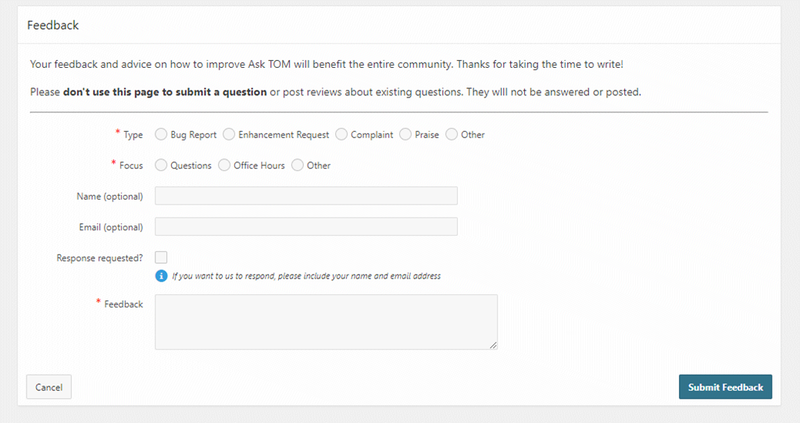 We get hundreds of thousands of question views every week in AskTOM. This drives our “Popular Questions” page on AskTOM. Whenever we tweet out about a particular AskTOM question, or pop it on Facebook, we log it here – because we don’t want to be spamming you. And that’s all there is to it. All driven by SQL, PL/SQL and of course the latest and greatest version of Application Express.